People have been preserving food for thousands of years. In geographical regions with harsh and long winters, it was often the only means of reliable and nutritious food during the bitterly cold months when nothing would grow. The abundance of the summer and autumn harvest, combined with human ingenuity, provided the means to survive the long, hard winter. Canning, or bottling food, reached its zenith in the nineteenth and early twentieth centuries as new recipes flooded in from India, and glass bottles and sugar became cheaper. Today, of course, we have the supermarket. Humankind has progressed. Not. The ‘just in time’ system of food stocking in virtually all western food stores means that we as a community are far more frighteningly vulnerable than we might suppose. (If just a single link goes down our food supply vanishes, and very few of us are prepared for that eventuality.) Far from fresh, most of the foods in modern supermarkets are many months old, and, moreover, are soaked in chemical additives and pesticides. Far from local, most foods have been shipped, trucked or flown in from as much as many hundreds, if not thousands, of miles away, meaning that rather than supporting our own community growers and producers with our purchases, we line the pockets of producers far away who have no attachment or meaning to us. And choice … we all eat the same very few and generally very bad brands. Supermarkets present very little choice at all. What they do offer us is expensive in terms of our long term health, of our environment, of our community, and of our purse. Chances are you care about at least one of those issues. When I was a child fifty years ago I could remember home preserves (in my family it was my father who enjoyed preserving, rather than my mother). Then my family, as so much of the western world, fell under the thrall of the supermarket, and home preserves vanished. Now I, like so many people, am returning to the old ways of home preserving. Why? For me, personally, it is because I want amazingly tasty, chemical free, cheap foods that are a direct product either of my own garden or of my local community and which, most importantly, provide me with such a sense of well-being and achievement that I here and now freely admit I have become addicted by the wiles of home preserving. Home preserving is not difficult. Generally speaking, with the addition of a few kitchen items (most of which you will likely already have), it can be done without any expensive or difficult equipment. Better yet, it can be achieved without any nasty chemicals at all – often with nothing more than a little hot air. While there are many methods of preserving, the two I use most are hot water bathing, and dehydrating. Dehydrating needs only a dehydrator (or even just some wire screens in the sun), and hot water bathing needs only some glass jars, some pop top lids, and a big stockpot. I will just say a few words about this. Dehydrating preserves food by removing its water content. It preserves all of the food’s nutritional content, including its live enzymes so long as you dehydrate at a low temperature (generally no more than 40 Celsius – 105 Fahrenheit). Store food in airtight glass jars afterward and, depending on the food, it will last years. I generally dehydrate all my herbs, many of my fruits and vegetables, and I also make teas. You can also dehydrate meat as jerky, although I have never done this. Buy the best dehydrator you can. Always buy one with a variable temperature control. Most of the cheap non-variable dehydrators are set at about 80 c (210 F) which is far too hot – it will ‘kill’ the food, depleting its nutritional content. Also try to get a dehydrator that is expandable – mine can expand to 30 trays, and during harvest season I can use every one of those 30 trays! As with all preserving – obey the golden rule of keeping things scrupulously clean. Wash your hands before handling food, and put processed food into sterilized jars (I sterilize all my jars quickly and easily by washing them in hot water and then standing them on a towel in the oven – set at 110 C (about 240 F) – for about 20 minutes – I’ve never lost a jar this way). A large pan – generally the wider mouth the better, but I have used stock pans often without a problem when I am doing large quantities. Wide pans are useful though as many preserves get simmered for hours to reduce them down. If the pan has a heavy bottom then it will help to prevent burning – my favourite preserving pan is a huge old cast iron pan, but for large batches I use an ordinary – if very large – steel stockpot. jars and lids – see the discussion below in the hot water bathing section for the kinds of jars you can use. some old tea towels for handling hot jars and general sticky cleanup. 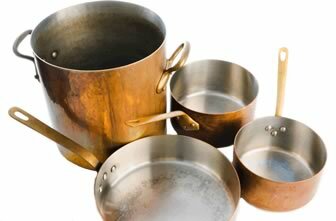 Golden rule of preserving – keep everything scrupulously clean to avoid bacteria. 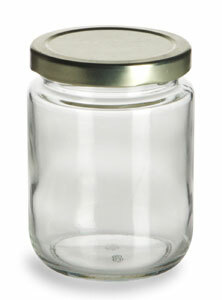 Jars and lids will need to be sterilized before you put your preserve into them. Jars and bottle can be sterilized in the oven (see above) and lids can be simmered in hot water until you need them. Badly stored preserves (anything from pickles to meat to jam) can harbour botulism. Botulism kills. You don’t want it in your food. Really. You can avoid it in any bottled preserves (dehydrated food is too dry to grow botulism so is not at risk … unless it gets damp) by boiling many of them in hot water for a set amount of minutes – it is a quick and easy process which will kill botulism spores. Once you have made your preserves (see my recipe section for some of my favourite preserves), wrap a few of the jars in strips of old cloth kept in place by rubber bands (this stops the glass breaking if the jars bump against each other in the boiling water), pop them in a big stockpot on some kind of stand (the jars must not touch the bottom of the pot which is in direct contact with the heat), cover them with hot water to a depth of perhaps an inch over the top of the jar, and process at a constant low roiling boil for anywhere between 5 to 30 minutes (how long depends on your altitude and the preserve … times are given in my recipe section or you can check out the USDA guidelines, links given below). Once done, remove from the water and allow to cool. I use ordinary jars saved from the supermarket with poptop lids (depicted just above). Once removed from the pot of boiling water, the poptop lids will depress as the cooling jar forces out air and creates a vacuum within the jar. Never use food from a jar where the pop top has popped up – that means the seal has broken and the food is spoiled. I always, always use new lids for each jar – I do not reuse the old ones. The rubber seals on them can develop microscopic cracks which leads to, yes, you guessed it, a nasty case of botulism. Don’t ever take shortcuts with preserving. Australians can buy the new poptop lids (as well many other preserving supplies) at Greenliving Australia. If in Australia you might also use the Fowlers Vaccola system of lids and jars, or if in America the Ball Mason jars with screw on bands and lids (I also use these). They all do the same job. Some foods (bottled meat, or some low acid vegetables) require pressure canning to avoid botulism. I do have a pressure canner but no reliable stove on which to use it, so for the moment I do not pressure can. Once I get a new and improved stove, well then ….then I shall! If you do want to pressure can, make sure you follow the instructions provided with your pressure canner precisely. In the meantime I dehydrate low acid vegetables as that keeps them safely and is simplicity itself. Now, with just these basic items, you are all set for preserving! Oded Schwartz, Preserving (DK Books, 1996). Unfortunately no longer in print, the book can still be bought from secondhand bookshops or sites like Alibris. This book is amazing. Thank you to my neighbour Joanna for recommending it to me. Preserving Food Without Freezing or Canning: Traditional Techniques using Salt, Oil, Sugar, Alcohol, Vinegar, Drying, Cold Storage, and Lactic Fermentation – you can buy this from Amazon. The book will give you a broad glimpse into some very traditional French preserving techniques, and is quite wonderful. Digby Law’s Pickle and Chutney Cookbook – an old favourite. Here is one site which sells it, otherwise just google the title for somewhere to buy – you won’t be able to get this in shops. I also encourage you to download the pdf files of the “USDA Complete Guide to Home Preserving” (note that canning = bottling) which will give you the most modern methods of safe preserving. Added by editor – Vicky was a regular contributor to Sara’s blog and runs her own website on about preserving, canning and cheesemaking.